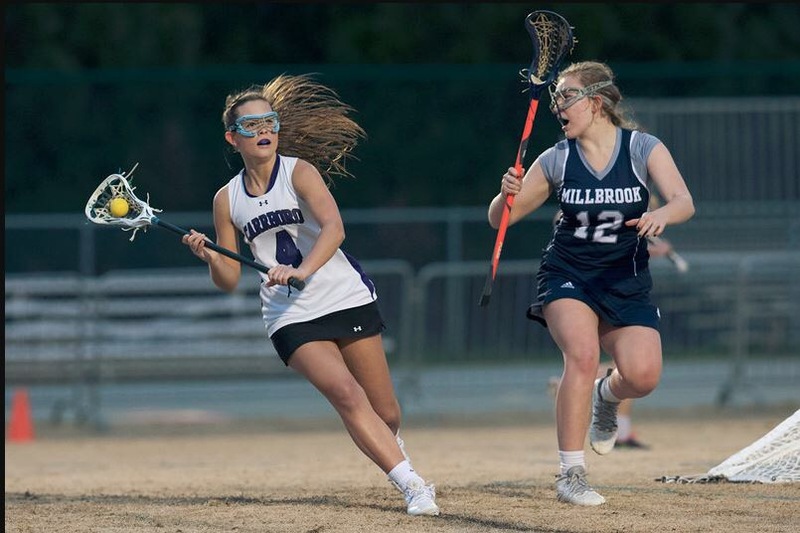 On April 26, one of the best women’s lacrosse athletes Carrboro High has ever seen reached another milestone; senior Mackenzie Cox scored her 200th goal against Riverside, completing two centuries worth of goals over her four years playing for CHS. The goal came during this year’s senior night game, punctuating a 14-13 win for the Lady Jags. Cox joined the women’s lacrosse team in 2015, her freshman year at CHS, and has started in each of her four years playing for the team. Over those four years, she’s accumulated 207 total goals, 220 overall points, and averaged 4.8 ground balls recovered per game. Those statistics have earned Cox three consecutive Carrboro Offensive Player of the year awards, with a fourth expected this year. Similarly, Cox’s on-field achievements have earned her a spot on the first All-Conference team for the past three years, with her spot on this year’s team pending confirmation. “I was motivated by always wanting to play the best I could for my teammates and coach. I would also like to say thank you to all of the players and especially my dad that have helped me along the way because without them I never would have the amazing experience that I did on the Carrboro women’s lax team,” said Cox. Being the leader in all-time goals for Carrboro’s women’s lacrosse team is an enormous achieve- ment, and Cox credits hard work in getting her there. “I never imagined being able to make a record like that,” Cox said. In completing her two centuries of goals, Cox reaches a milestone that no other Carrboro student has before — Cox is the first and only Lady Jag to score over 200 career goals. Going forward, Cox looks to maintain involvement in lacrosse; she aims to play club la- crosse at UNC-Wilmington next year, and to coach and help out with youth teams in the area. Cox credits those youth teams with giving her access to the sport early on, leading to her later success. For young players, she says, it’s vital to always give your full effort. “Never let anyone tell you are not good enough to do anything,” Cox said, a fitting sentiment for someone who has accomplished so much. Game day: fans flood arenas wearing team jerseys, searching for events to meet their dream players and gain an autograph. Those who don’t make it to the event itself sit impatiently by their laptops and T.V.s waiting for their streaming service to begin airing. All wait to watch those who’ve spent hours honing their skills. But these ‘athletes’ aren’t who you think they are. They aren’t big football or basketball players — they’re gamers. Competitive video game playing, known as eSports, is on the rise. If you play video games — especially Multiplayer Online Battle Arenas (MOBA) — you are sure to know about eSports and how they work. However if you haven’t, here is some information on the sport that’s grabbing attention from gamers. Any game can be made into an eSport when there’s a clear winner, but the game type that is most popular is MOBA. In MOBAs, players form teams and compete tournament-style in arenas and large game maps. Examples of such games are League of Legends (LoL), Dota 2 and Overwatch. Each game has its own fan base and has companies like NHL who hold tournaments that gain more popularity over time. A lot of supporters of ‘real’ sports are supporters of eSports as well, like ESPN, which doesn’t only stream football, but also LoL and Dota 2. Most of these competitive games are also aired on streaming platforms such as Youtube and Twitch. Now, a big question to a new person may be, “what do these gamers gain by professionally competing?” The answer to that is simple. Most players come in to gain the cash prizes and glory like ordinary athletes would. International competitions have especially big cash prizes that amount to millions of dollars and sponsorships to team involved. Many leagues now offer salaries along with that. Though this may seem like an easy job to handle, most players in eSports leagues don’t last long, and many of these players get looked down upon by those who don’t play video games. Not only that, but to get into these leagues a player must have a high rank or status in their game and must possess certain skills that most other gamers don’t have. They also need strategic minds and reflexes fast enough to outplay an enemy in the heat of the moment while millions of fans watch them. eEports is steadily growing along with the amount of fans that keep up with it. If it continues at this rate, then people will learn more about competitive video games, and eSports could become closer to gaining mainstream acceptance. 1: How do the goals that your team set before the season compare to the results of the season? 2: What’s been the highlight of the year with your teammates not on the court/field/track? 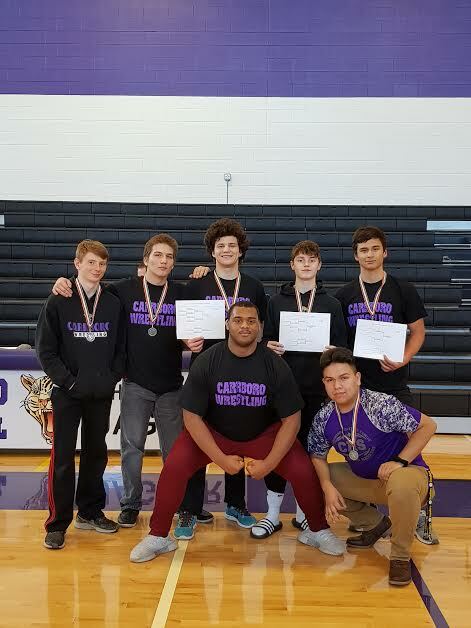 Here are some interview highlights from Carrboro’s spring athletes. When did you start playing ultimate frisbee? I started throwing the ultimate frisbee when my brother was in sixth grade, so I was in second grade, and I started playing when I was eleven. What are the Carrboro Clams? The Carrboro Clams are the Carrboro High School ultimate frisbee team; it’s a club and it’s fun. Why are you called the Carrboro Clams? We are the clams because when Carrboro High School was deciding their mascot, the clams were the runner up mascot choice. So we’re the clams. Because we’re a club we can’t use the Jaguars as our mascot because we’re not a school sponsored team. Who are the team’s coaches? Head Coach Skylair … he played Ultimate at UNC and he plays club ultimate. There’s three assistant coaches: Matt Oliveti, who plays club ultimate, and then two UNC players, Mark Rodner and Nathan Dierhuys. When did you start playing for the Carrboro Clams? What is your favorite part about ultimate frisbee? I really like their spirit of the game idea, which is that the most important part of the game is to be respectful and be a good person and do the right thing instead of just being rude to other players and trying to get in their face. So it’s really different from other sports where people are just hostile. Do you think you are going to continue to play after high school? I will, I’m trying to continue. A lot of colleges have ultimate teams. So… I mean that’s not a reason I would go to college but it’s definitely a big part of my life. Would you say that ultimate frisbee is an overlooked sport? If so, why? I think it is overlooked. I think it’s like frowned upon in the social eye, but I think it’s really enjoyable. I think a lot of people have fun doing it, and people should give it a shot. I think people see it as a nerdy or sort of un-athletic sport. Maybe at beginner levels that’s true, but at advanced levels it’s really competitive and intense and I think people just don’t see that. Is there anything that you want people who don’t play ultimate to know? It’s really fun. It’s really competitive and people should give it a shot before they judge people for doing it. Another year for the CHS women’s soccer team’s season has started, and it started on a good note. With a lot of success so far, the team is starting off the season strong. Like all high school teams, there is a mixture of athletes from all grades. From new freshmen to veteran seniors, there can be pretty different perspectives on the team and its players. Katie Rhodes is a new freshman on the team but not new to soccer. She has been playing for years, including throughout middle school and on club teams. “At first, I didn’t think we weren’t going to do so well, but starting at our practices, we’ve been doing a lot better,” said Rhodes when asked about the season ahead. There are other players who would agree that the season will be successful, but realize they are treading on new turf. 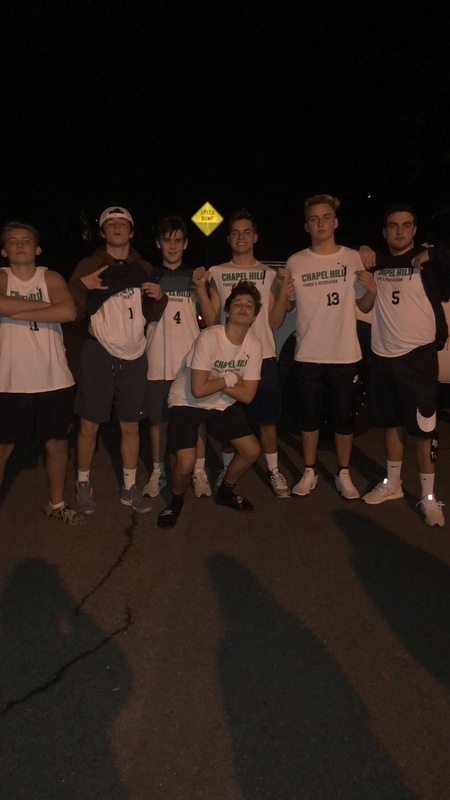 With seniors from last year graduating, the soccer team is taking on a new wave of freshmen; the team has to, in a sense, start over when it comes to introductions and trust. The team has big shoes to fill, coming from a track record of three consecutive championships in the last three years. Trust and cooperation, between everyone, is a necessary component to continuing that record. “I think it’s hard to tell. I think we have a lot of potential and we just have to see where it goes,” said Lauren Gilliam, senior team captain. “I think, right now, the problem is just that we don’t really know each other that well, so I think we just need to develop a mutual trust and once we do that, it’ll be a lot better,” said Ashley Hong, sophomore team member. Even with all the new freshmen, this year’s leaders will draw from their past three and a half years of experience to guide their team in the right direction. There is a lot that comes with being a senior on the team, and Gilliam likes that. “I guess I like having more responsibility,” said Gilliam. Being a leader means that you are being looked up to by all the people around you. All the players, especially younger players, rely on their captains and older teammates to be pillars of stability and confidence as they go through the season. 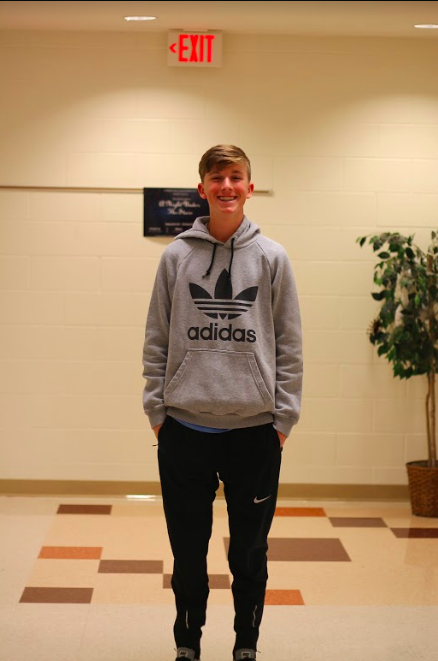 “I definitely look up to all the seniors for advice, especially when it comes to soccer. But not just inside soccer, outside of soccer too. I’ll talk to them too if I need help,” said Hong. There is a general consensus among team members that the season ahead will be a good one. With the whole team dynamic changing, however, there will be some struggles that the team will have to overcome. Claire McDaniels, sophomore, trains approximately five hours a day and plans to make a splash at the 2020 Tokyo Olympics. (Though not literally, of course.) Last year, McDaniels won the 1A/2A Diving State Championship for CHS as a freshman, and she plans to take her talent to the next level. McDaniels is a competitive diver who sacrifices much of her free time for her sport. “I go to morning practice on Tuesdays, Wednesdays, and Thursdays. And then everyday after school,” said McDaniels. “Practice is two hours in the morning, three at night, and an hour after school on Wednesday and Saturday of weights. On the weekends I train two to four hours in one day,” said McDaniels via email. She misses first and second period to dive, and last year she left school early for the same reason. To her, the time commitment is worth it. “I dive at Duke, all the way in Durham. I enjoy it a lot… and I’m very passionate about it,” said McDaniels. Still, it can be difficult to balance diving and academics. McDaniels’ practices consist of serious stretching, a warm up on the trampoline and tumbling. Finally, she practices the dives that she plans on performing in meets. McDaniels’ interest in diving first piqued when her family introduced the sport to her at a young age; her brother and mom dove in college. “I started diving because when I was little I saw my brother dive, and I thought it looked really cool and so I tried it out! Everyone in my family has dove a little bit. During the summer they all asked me to come watch them do their own tricks off our summer league diving board,” said McDaniels in an email. McDaniels explained that getting into the Olympic trials is often the most difficult part of the Olympic experience. “We start out with going to regionals, [and] this qualifies us to go to zones. At zones we get qualified for nationals. Then at nationals we go through a prelims, semifinals, and finals type of competition. After nationals you have to score and get a certain place in your age group in order to be qualified to go to trials,” said McDaniels via an email. Still, her journey isn’t over once she reaches trials. “At trials you do the same thing as national, and if you place first or second then you get put on the Olympic team and go to the Olympics,” said McDaniels via email. McDaniels has experience with this process before, and she placed well in important competitions. “Last year I went through this and got myself qualified for junior world nationals, which are equivalent to the Olympics but are in the opposite years of them, ” said McDaniels. Although not admitted onto the Olympic team yet, McDaniels is confident that she’ll make the cut and represent America in the upcoming years in diving.